Explore the depths of your sound with this board-friendly stomp. 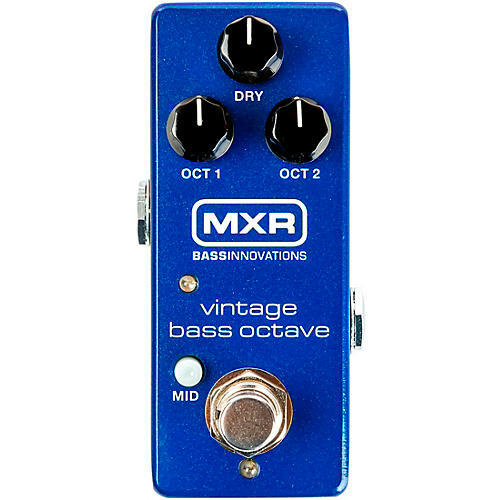 The voice of the Vintage Bass Octave is rich and throaty, and it comes in two forms—one octave down and two octaves down. Each can be dialed in separately with the Oct 1 and Oct 2 volume controls, and with a Dry volume control to dial in your clean signal, you can concoct just the right blend for your rig. For extra clarity and definition, use the Mid switch to boost your clean signal’s midrange at 800Hz by +6dB. Want even more of a boost? Just remove the bottom plate and adjust the internal trimpot to kick it up as high as +13dB. Finally, this pedal comes equipped with Constant Headroom Technology, a custom circuit that provides clean, crystal clear headroom by producing 18-volts from a 9-volt power source. The Vintage Bass Octave is a pedalboard-friendly, must-have for bass players who want to plumb the sonic depths of their instrument.